Recreational vehicle (RV) manufacturers use APA trademarked plywood and OSB (oriented strand board) structural panels in motor homes and mini-homes, in travel trailers, fifth-wheel trailers and tent trailers, in vans, pickup campers and all kinds of special-order, custom-made and converted units. Typical applications include floors, cabinets, bed boards, wall linings, counter tops, seats, shelving, roof decking, doors and miscellaneous bracing and mounting. Panel strength, stiffness and impact resistance contribute to safety while the light weight cuts fuel consumption. Another advantage is that APA Rated panels are exempt from U.S. EPA and California formaldehyde regulations due to their very low emission rates. For information on formaldehyde, visit our formaldehyde page. 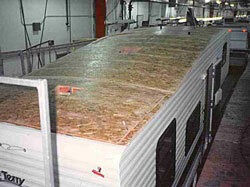 Several grades of plywood and OSB structural panels are recommended for specific RV applications. APA RATED SHEATHING Exposure 1 is particularly well suited for subflooring and wall and roof sheathing. APA RATED SHEATHING Exterior fulfills the same function under high moisture conditions. APA STRUCTURAL I RATED SHEATHING Exposure 1 and Exterior are unsanded structural grades for engineered applications where strength is of maximum importance, such as bracing, gusset plates and mountings. APA RATED STURD-I-FLOOR is recommended for floors – Exposure 1 for normal service, Exterior for applications subject to severe moisture. These single-floor panels possess high concentrated- and impact-load resistance. Underlayment is recommended for application over structural subflooring – Exposure 1 for normal service, C-C PLUGGED Exterior for applications where severe moisture may be present. These touch-sanded panels provide a smooth surface for application of finish flooring. 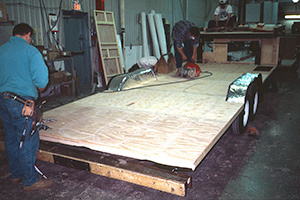 “Sanded face” is a special notation for panels intended for use under thin resilient flooring. C-D PLUGGED Exposure 1 panels are used for bed bottoms and other structural applications where appearance is not important. This grade is particularly popular for RV flooring, but lacks the puncture resistance of STURD-I- FLOOR and Underlayment grades. C-C PLUGGED Exterior panels are ideal for tile backing. A-D Exposure 1 and A-C Exterior are sanded grades for applications where the appearance of only one side is important – built-ins, cabinets, shelving, countertops, paneling, and front-end and sidewall linings. B-D Exposure 1 and B-C Exterior are utility sanded panels with one smooth side used for backing, built-ins and bed bottoms. MEDIUM DENSITY OVERLAY (MDO) panels provide an ideal base for paint and exhibit excellent abrasion resistance in such applications as cabinets and built-ins. These are the basic panels and applications for RV fabrication, although special panels and panel systems are available for other purposes. 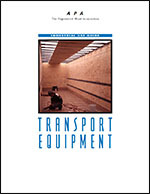 This publication includes panel grades and design criteria for truck, trailer, and intermodal container bodies and linings. It also includes information on recreational vehicles and buses.